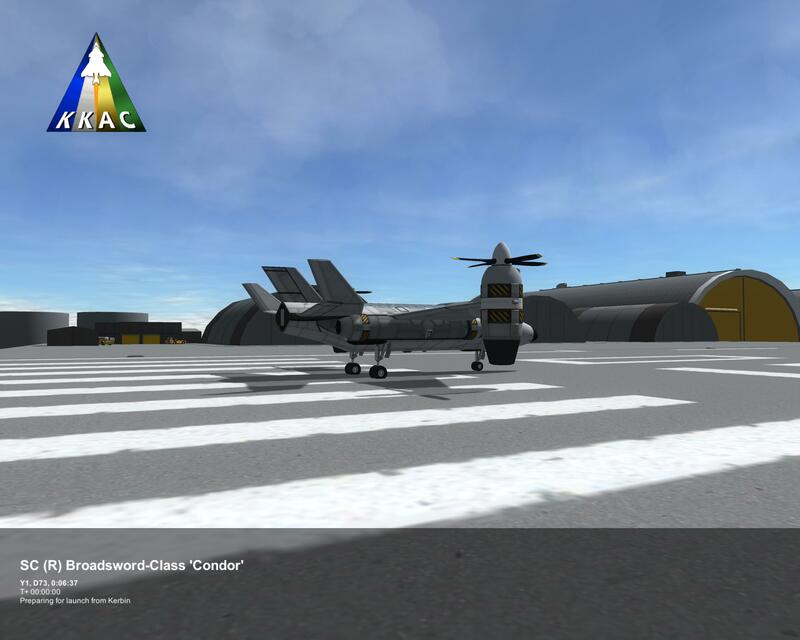 KerbalX - Broadsword-Class Science/Research VTOL Aircraft: "Condor"
Broadsword-Class Science/Research VTOL Aircraft: "Condor"
A mod aircraft called Broadsword-Class Science/Research VTOL Aircraft: Condor . Built with 69 of the finest parts, its root part is KAXmedCockpit. It seems that Jeb and Val got ahold of the plans for the Sentinel a few days ago; they were recently returned to our offices, with new blueprints attached and a hand-scrawled note that simply said More jets = more power! Using the modular parts from the Infernal Robotics corporation, Jeb designed a craft that used powerful combination rotating engines for both vertical and horizontal flight, and smaller turbofan engines for a cruise configuration. With a crew capacity too small to be a capable rescue craft, the Condor is more suited as a scientific, exploration, or passenger craft. Order yours today for only √90,000.